I need to open Outlook messages stored in a specific folder, and then get the attachments from those Outlook items. You can do this. You need to use Windows Scripting Host and Outlook's Application.CreateItemFromTemplate to open the messages. Once open, you can save the attachments or do whatever you need to do to the message. 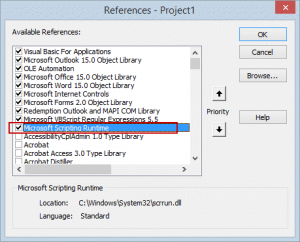 To use this macro, paste the macro in a module, then set a reference to Microsoft Scripting Runtime in the VB Editor's Tools, References dialog box. You'll need to enter the folder path where the MSG files are stored to the GetMSG macro. The folder where you want to save the attachments is stored in strFolderpath in the ListFilesInFolder macro. Click in GetMSG and press F5 or Run to use the macro. This code is not Outlook-specific (except for the code between the two Set openMsg lines) and can be used with Word or Excel. But ItemProperties don't have item. Why? First of all thank you so much for this piece of code which has helped me a lot in one automation that I am working on. However I am stuck at a place where instead of opening the mail message with ".Display" I want to do a "Reply All". When I try to do that I get an error saying "Run time error '-2147352567 (80020009)': Could not send the message". Kindly help me with this please. I am using Excel 2013 to run this code. when you open the message using the code, it should be appear as a new message draft, so no need to reply all - it's ready to send. Thank you for the code and it works well, however when the email msg is displayed only the attachments are shown. I wish to extract the attachments and then save the email without attachments to my local drive. Thank you and any assistance is welcome. How are you removing the attachments? Can you still see the body after they are removed? This works amazingly!!! Thanks you very much for this. I was wondering if it would be possible to save the attachments as the subject line of the emails they were contained within rather than the names they already have? if you have a problem with illegal characters in the subject, there is a function at the end of the macro at https://www.slipstick.com/developer/code-samples/save-messages-and-attachments-in-a-new-folder/ that can be used with this macro to strip the characters. I would like an email that i move to draft to automatically open. If file is already open then it can disregard rule. you can use an itemadd macro to watch the drafts folder and display messages that are added to it but I'm not sure about how complicated it would be to skip messages already open. I have code that saves an email from inside Access VBA to the file system. When I use the Set Msg = objOL.CreateItemFromTemplate(thisfile) I get an error saying the file is open or you don't have permission .. I have tried this with outlook being open and being closed still not able to access the msg. They are .msg files not meeting requests. They have .pdf attachments. The .msg files are however custom forms and perhaps this is why the script is failing. Are you running the macro from Excel? You need to dim and set Outlook.Application - I'm sure you've done that because you'd get an error about an undefined object otherwise. it's possible the custom form is the problem. I'll try to look into it in the morning. I am trying to run this using Excel 2010 and the folders I am using for the .msg files and for the attachments are both on my C drive. I have spent considerable time trying to find the answer on my own, but to no avail. Any suggestions for cause and solution would be greatly appreciated. Thanks!! Is the message an email message? If it's a meeting request or a report (read receipt, NDR etc) it won't work. Or, if you are using this with Excel, you don't have Outlook properly referenced. It's not quite the right error for a reference problem though.